In the feverish whirlwind of automotive fashion, there is seldom an opportunity to create a lasting and permanent statement. 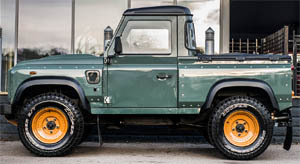 The Land Rover Defender, however, is a vehicle that defies the fickle fads of fashion. Since 1948, this towering automotive icon has been going about its business quietly and efficiently. 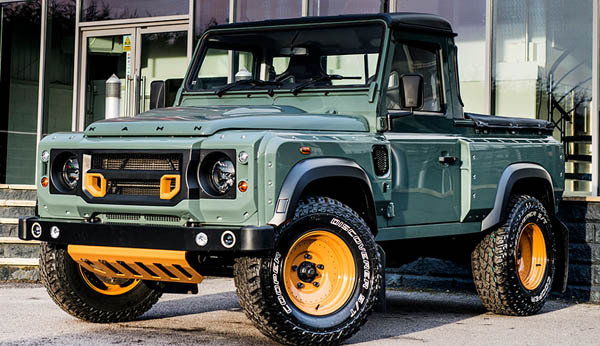 Defender has always been one of the world’s toughest and most relentless go-anywhere vehicles. That ‘anywhere’ would traditionally have been vertical mountainsides and searing desertscapes, rather than elite cultural events and tree-lined boulevards. But that changed forever, with the introduction of a new 2014 facelift defender. This is recognizable as a Land Rover, but like no Land Rover ever seen before. The wide 20” Mondial wheels in piano black with a precision diamond cut finish give the vehicle a muscular stance. The wheels are covered by powerful extended arches in sensual satin black; a colour echoed in the roof finish. The exterior enhancements are almost too numerous to list, but the Kahn bumper with piercing integral spot lights and robust sump guard, stainless steel twin crosshair exhaust system and mesh bonnet & side vents are notable additions. The most impressive element of the whole ensemble is the imposing new X-Lander grille and headlamp surround. 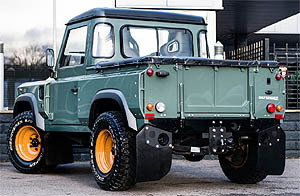 This changes the face of the Defender and lends an air of brutish power, yet combines it with elegant sophistication. The X-Lander has been designed to be an easy installation, using the factory mounting points, yet has distinct paint areas that allow almost immeasurable customization. If the commanding and purposeful exterior bludgeons the senses, then the antidote is in the svelte and luxurious cabin. 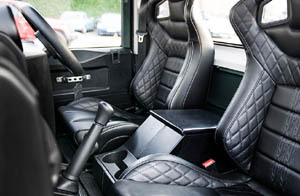 Figure hugging GTB seats, hand trimmed in soft, quilted, perforated leather are a foil to the precise machined aluminium pedals and tastefully re-faced instrumentation. The leather steering wheel and Harris Tweed interior detailing are the finishing touches that complete this distinguished interior. Discreet Kahn branding completes the package and leaves no-one in any doubt as to the source of this elegant functional design and meticulous attention to detail. You will never look at a Defender in the same way again.